Zorbitz Bracelet, Medicmates Acupressure Band, Copper Bracelet! 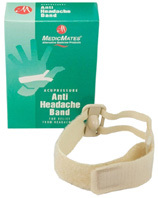 MedicMates acupressure bands are specially designed adjustable bands with an attached, PATENTED nugget that is anatomically designed for effective treatment of specific health-related complaints. • Anti-Nausea (Motion/Morning Sickness): Motion sickness arises in various situations. Sea, plane, car, or amusement rides can all induce the agonizing symptoms of nausea, vomiting, sweating, and weakness. Motion sickness occurs when signals from the inner ear and the eyes conflict with one another. Nausea can also be a result of pregnancy (morning sickness), or a side effect of drugs such as chemotherapy. 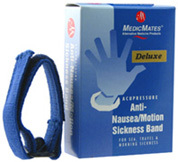 MedicMates anti-nausea band gently stimulates the nei-kuan acupoint, located approximately three finger widths up from the prominent first crease, dividing your palm and wrist, and found between two tendons. Detailed instructions and illustrations for placement are included with the bands. The anti-nausea band is amazingly effective for even the most severe sufferers and can be used as a preventative measure or after symptoms have occurred. Unfortunately, some drug therapies available for nausea cause drowsiness, often limiting decision-making capability. Acupressure is a natural , drug-free alternative without side effects. • Anti-Headache: Unfortunately, headache pain can and does interfere with the quality of daily life. Most headaches are caused by tension in the muscles of the face, head, neck and shoulders. When certain key nerves that regulate blood vessels and bioelectrical flow around the head and neck are constricted, the natural state of balance becomes irregular, resulting in various levels of headache pain. Sadly, studies now show that repeated use of painkillers can actually increase the frequency and severity of headaches (drug rebound headaches). The MedicMates anti-headache band targets the Hoku (L14) acupoint located in the webbing between the thumb and index finger , at the highest point of muscle . Acupressure is considered an alternative treatment by both the National Headache Foundation and National Migraine Foundation. Most importantly, acupressure has been shown to diminish pain ranging from minor headache or hangover to intense migraine, and provides a natural, drug-free alternative for headache pain. • Sleep Aid: Insomnia, contrary to common perception, is not defined by the length of time it takes to fall asleep, nor the number of hours that follow. Insomnia is a complaint of inadequate or interrupted sleep that leaves the sufferer feeling unrefreshed. As a result, many complain of daytime fatigue, lack of energy, difficulty concentrating, and irritability. If transient (short term), or intermittent (on and off), the cause of insomnia may be due to stress or anxiousness. Sadly, insomnia in itself causes more nervousness, thus creating a cycle of suffering. By using the H7 acupoint, the MedicMates sleep-aide band can diminish the “stressed” feeling , and allow the body to enter a more relaxed state. The H7 acupoint is always located on the inside of the wrist , in line with the little finger, on or near the wrist crease in the small hollow just below the palm of the hand. Unlike many therapeutic drugs, acupressure has no side effects, and is completely natural. Since early times, copper and magnets are believed to be helpful in alleviating arthritis and rheumatic symptoms. The bracelet consists of copper with small magnets attached at both ends. • Copper Bracelet Elegant Design: ORDER TODAY! • Copper Bracelet Divergent Design: ORDER TODAY! • Copper Bracelet Dazzling Design: ORDER TODAY! • Copper Bracelet Bella Design: ORDER TODAY! • Copper Bracelet Poise Design: ORDER TODAY! • Copper Bracelet Grace Design: ORDER TODAY! To Show You Are Hook'd To Someone Special Wear Towards Your Heart. To Catch that Someone Special Wear Outward. • Hook & Co. Leather Bracelet Pink: One Pink Leather Bracelet with Silver Hook. Adjustable. ORDER TODAY! • Hook & Co. Leather Bracelet Red: One Red Leather Bracelet with Silver Hook. Adjustable. ORDER TODAY! • Hook & Co. Leather Bracelet Gray: One Gray Leather Bracelet with Silver Hook. Adjustable. ORDER TODAY! • Hook & Co. Leather Bracelet Brown: One Brown Leather Bracelet with Bronze Hook. Adjustable. ORDER TODAY! • Hook & Co. Leather Bracelet Black / Silver Hook: One Black Leather Bracelet with Silver Hook. Adjustable. ORDER TODAY! • Hook & Co. Leather Bracelet Black / Bronze Hook: One Black Leather Bracelet with Bronze Hook. Adjustable. ORDER TODAY! • Wax Seal Bracelet Love & Friendship: Love and Friendship Wax Seal Amulet Bracelet is engraved with a Rose for Love and Ivy Leaves for strong and lasting Friendships. 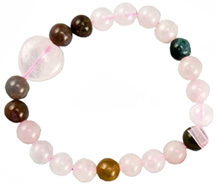 Together with the Rose Quartz gemstones, this bracelet may bring you Great Relationships, Everlasting Friendships and Eternal Love. ORDER TODAY! • Wax Seal Bracelet Happiness: Happiness Wax Seal Amulet Bracelet is engraved with a Dove and an Olive Branch, which are symbols for Peace and Happiness. 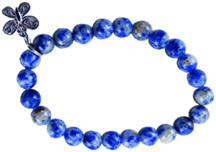 Combined with the Blue Sodalite gemstones, this bracelet may bring you Peace and enrich your life with Happiness. ORDER TODAY! • Wax Seal Bracelet Luck & Miracles: Luck and Miracles Wax Seal amulet bracelet has a Horse Shoe wax amulet on an Agate gemstones bracelet. Charm Made in USA. ORDER TODAY! • Wax Seal Bracelet Good Health: Good Health Wax Seal Amulet Bracelet is engraved with Angel Wings and Flowers on an Amethyst bracelet. ORDER TODAY! • Wax Seal Bracelet Protection: Protection Wax Seal Amulet Bracelet is engraved with a Lion for Courage, a Shield for Protection and a Crown for Authority and Royalty. 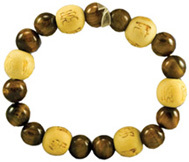 Together with the Tigers Eye gemstones, this bracelet may bring you Protection, Courage and Prosperity. ORDER TODAY! 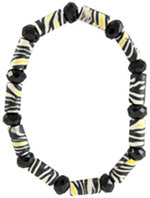 • Wild Things Bracelet Tiger: One WILD THINGS bracelet with Tiger striped clay beads and black crystals. Like a Tiger, you are magnificent and distinctive. ORDER TODAY! 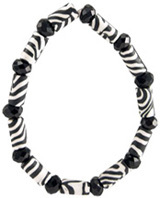 • Wild Things Bracelet Zebra: One WILD THINGS bracelet with Zebra marked clay beads and black crystals. Like a Zebra, you are a great companion.ORDER TODAY! • Wild Things Bracelet Leopard: One WILD THINGS bracelet with Leopard marked clay beads and black crystals. Like a Leopard, you are graceful and superior. ORDER TODAY! • Wild Things Bracelet Jaguar: One WILD THINGS bracelet with Jaguar marked clay beads and black crystals. Like a Jaquar, you are resilient. ORDER TODAY! 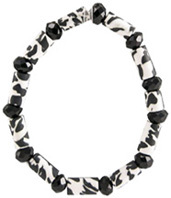 • Wild Things Bracelet Cow: One WILD THINGS bracelet with black crystals, and cow print clay beads. Like a Cow, you are gentle and helpful. ORDER TODAY! Recycled. Made With Recycled Metal. Made in USA. 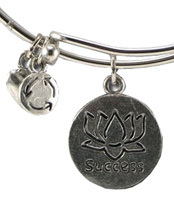 • Recycle Bangle Bracelet Success: Present this recycled bangle as a token to dream big, work hard, and never give up. You can bloom like a Lotus flower, representing unexpected miracles, to accomplish the success you have always dreamed. ORDER TODAY! • Recycle Bangle Bracelet Save the Earth: Show this recycled bangle as a gift of the little things you do every day to help Save the Earth. This Charm signifies the Tree of Life and the deep-seated you are in doing good things, the superior your life can flourish with delight and joyfulness. ORDER TODAY! 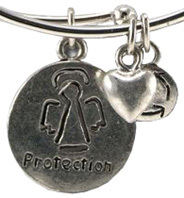 • Recycle Bangle Bracelet Protection: Put on this recycled bangle as a memento that your Guardian Angel is watching over you and can protect you and your family always. ORDER TODAY! 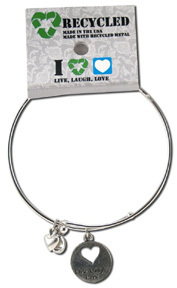 • Recycle Bangle Bracelet Live Laugh Love: Adorn this recycled bangle as a reminder to live completely, laugh often and celebrate every moment. This heart symbolizes love, friendship and great relationships. ORDER TODAY! 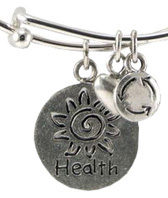 • Recycle Bangle Bracelet Good Health: Reveal this recycled bangle as a reminder to eat and live healthy and let this Sun awaken your senses to an energized, blissful and beautiful life. ORDER TODAY! Comes on a plantable seed paper. Tear Greenie Card into pieces and put in soil. Cover With More Soil. Water. Watch It Grow. For every four greenies we plant one tree. Be a greenie, change the world. 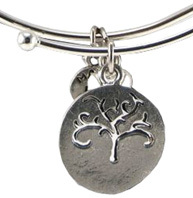 A portion of every purchase price is donated to The Nature Conservancy to help plant trees. Save The Trees! • Lucky Greenie Bracelet Protection: Dress up with this bracelet always and your life can be protected from evil, negativity and harm, your stress can be lifted, and you will become a beautiful flower. ORDER TODAY! • Lucky Greenie Bracelet Happiness: Adorn this bracelet always and your life can flourish with wealth of happiness, peace and joy. ORDER TODAY! 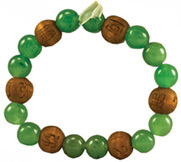 • Lucky Greenie Bracelet Good Health: Put on this bracelet always and your life can prosper with good health, inner strength, peace and joy. ORDER TODAY! • Lucky Greenie Bracelet Love & Friendship: Make a wish, wear this bracelet always and your life can develop with love and friendship and your wishes can come true. ORDER TODAY! • Lucky Greenie Bracelet Miracles: Present this bracelet always and your life can be filled with many unexpected miracles and everything you desire can come your way. ORDER TODAY! 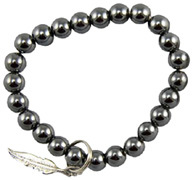 Look beautiful, feel beautiful with this Genuine Magnetic Hematite Bracelet. The power of Hematite is believed for centuries to help relieve pain, stress and bring happiness into your life. 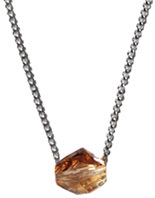 Dazzle with the beauty of this Swarovski Elements Crystal. Made in the USA. • Vicente Bracelet Swarovski Magnetic Happiness: Hematite Bracelet with Aurora Borealis colored Swarovski Elements Crystal. ORDER TODAY! • Vicente Bracelet Swarovski Magnetic Good Health: Hematite Bracelet with Amber colored Swarovski Elements Crystal. ORDER TODAY! • Vicente Bracelet Swarovski Magnetic Protection: Hematite Bracelet with Swarovski Elements Crystal. ORDER TODAY! • Vicente Bracelet Swarovski Magnetic Love: Hematite Bracelet with Rose colored Swarovski Elements Crystal. ORDER TODAY! • Vicente Bracelet Swarovski CharmMagnetic Wealth & Prosperity: Hematite bracelet with Wealth charm. This charm symbolizes Wealth & Prosperity. ORDER TODAY! 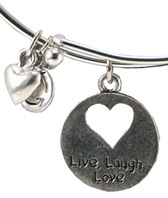 • Vicente Bracelet Charm Magnetic Happiness: This charm symbolizes Peace & Joy. Hematite bracelet with Peace & Joy charm. ORDER TODAY! • Vicente Bracelet Charm Magnetic Protection: Wear daily and this charm will symbolize Protection. ORDER TODAY! • Art of Luck Friendship Bracelet Sodalite / Butterfly Charm - Live Healthy: Blue Sodalite can fill your life with joy, inner strength and pure peace and can encourage in weight loss. In concert with the Butterfly charm, you have the power to transform into the person of your dreams, ORDER TODAY! • Art of Luck Friendship Bracelet Amethyst / Angel Wing Charm - Good Health & Protection: Amethyst can fill your life with good health, inner beauty and inner strength. This Wing charm from your Guardian Angel can protect you from evil, negativity and harm. ORDER TODAY! • Art of Luck Friendship Bracelet Rose Quartz / Heart Charm - Love & Friendship: Rose Quartz can draw love and can fill your life with inner beauty, romance, great relationships, and endless friendships. A Heart charm is a symbol of your heart to those you love. ORDER TODAY! • Art of Luck Friendship Bracelet Hematite / Feather Charm - Happiness & Strength: Hematite can appeal positive energy into your life and bring you a lifetime of happiness, joy, bliss and many beautiful moments that you will treasure forever. The Feather charm embodies being a warrior and can provide you the strength and courage to achieve everything you desire. ORDER TODAY! • Art of Luck Friendship Bracelet Onyx / Peace Sign Charm - Peace & Success: Onyx can protect you from evil, keeping you safe from harm, negativity and wrong doers. The Peace Sign Charm signifies peace and harmony and can attract a lifetime of Well Being. ORDER TODAY! • Art of Luck Friendship Bracelet Agate / Star Charm - Unexpected Miracles: Agate can appeal many Unexpected Miracles into your life. With this Star charm, if you work hard to be a good person, then everything you desire can come your way. ORDER TODAY! 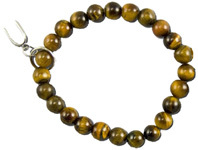 • Art of Luck Friendship Bracelet Tiger Eye / Horseshoe Charm - Protection & Good Luck: Tigers Eye can repel evil, protecting you from evil, negativity and harm. This Horseshoe charm signifies good luck and can attract a lifetime of Luck and Good Fortune. ORDER TODAY! • Art of Luck Friendship Bracelet Aventurine / Lucky Charm - Great Wealth: Made from genuine Aventurine so that you can overflow with good luck, prosperity and success. This Lucky charm can fill your life with endless of Good Luck. ORDER TODAY! • Live, Love, Hope Bracelet Faith & Hope / Rose Quartz: A Rose Quartz Heart is cherished since it brings forth love, compassion, and inner beauty. Together with seeds of the Lotus flower, your life can overflow with Love and the Faith, Hope and Courage to overcome every challenge and succeed beyond your wildest expectations. ORDER TODAY! • Live, Love, Hope Bracelet Unexpected Miracles / Agate: Uniting the Rose Quartz and Agate gemstones; your life can pour out with Love and Unexpected Miracles and everything you desire can come your way. Rose Quartz Heart is valuable since it brings forth love, compassion, and inner beauty.ORDER TODAY! 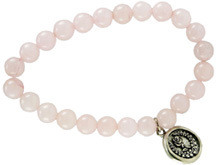 • Live, Love, Hope Bracelet Good Luck / Pink Jade: Merging the hand carved Lotus and Flower Pink Jade and Rose Quartz gemstones, your life can overflow with Love, Good Luck, Good Fortune, and success in every aspect of your life. A Rose Quartz Heart is prized since it brings forth love, kindness, and inner beauty. ORDER TODAY! 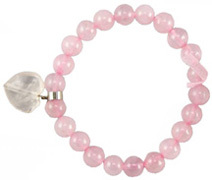 • Live, Love, Hope Bracelet Love / Rose Quartz Heart: Together with the Rose Quartz gemstones and the Rose Quartz heart, your life can overflow with love, friendship and many beautiful moments that you will treasure forever. A Rose Quartz heart is adored since it brings forth love, compassion, and inner beauty. ORDER TODAY! • Live, Love, Hope Bracelet Happiness / Hematite Magnetic: Combined with the Rose Quartz and Hematite gemstones, your life can overflow with Love, Happiness, and many Magical Moments. 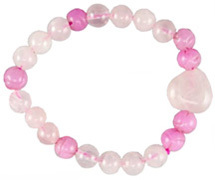 Rose Quartz Heart is valuable since it brings forth love, compassion, and inner beauty. ORDER TODAY! Make a wish, wear these lucky beads always and you can be healthy, strong, and all your dreams can come true. 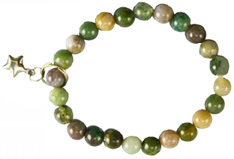 Natural Gemstone Bracelet. 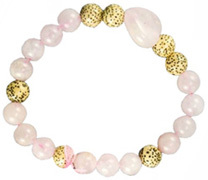 • Karma Kids Bracelet Rose Quartz / Love & Friendship: One Rose Quartz and Karma beads bracelet. Adorn these lucky beads always and you can be surrounded by love and the best friends in the world. ORDER TODAY! 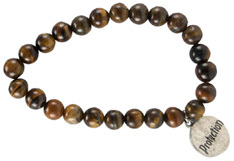 • Karma Kids Bracelet Tigers Eye / Protection: One Tigers Eye and Karma beads bracelet. These lucky beads can help protect you. ORDER TODAY! 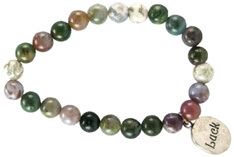 • Karma Kids Bracelet Aventurine / Good Luck: One Aventurine and Karma beads bracelet. When you wear these beads, you can always be lucky. ORDER TODAY! 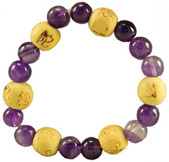 • Karma Kids Bracelet Amethyst / Wishes & Dreams: One Amethyst and Karma beads bracelet. Dress up these lucky beads always and you can be healthy, strong, and all your dreams can come true. ORDER TODAY! 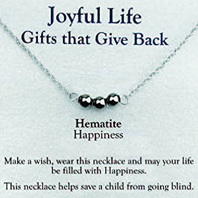 A portion of the sale of the Joyful Life Necklace helps save a Child From Going Blind with Vitamin Angels. 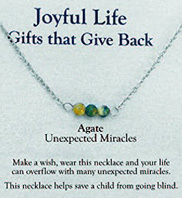 • Joyful Life Necklace Agate / Unexpected Miracles: Wear this necklace and your life can overflow with many Unexpected Miracles. One Necklace with Agate Beads on a 18 inch Silver Chain. ORDER TODAY! 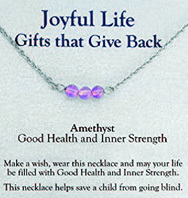 • Joyful Life Necklace Amethyst / Good Health & Inner Strength: Adorn this necklace and may your life be filled with Good Health and Inner Strength. 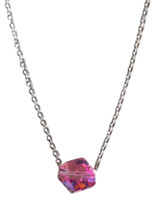 One Necklace with Amethyst Beads on a 18 inch Silver Chain. ORDER TODAY! • Joyful Life Necklace Hematite / Happiness: Show this necklace and may your life be filled with Happiness and may all your wishes come true. One Necklace with Hematite Beads on a 18 inch Silver Chain. ORDER TODAY! 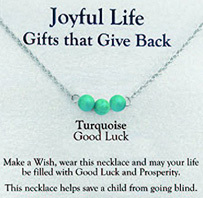 • Joyful Life Necklace Turquoise / Good Luck: Wear this necklace and may your life be filled with Good Luck and Prosperity. One Necklace with Turquoise Beads on a 18 inch Silver Chain. ORDER TODAY! 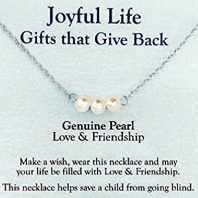 • Joyful Life Necklace Genuine Pearl / Love & Friendship: Display this necklace and may your life be filled with Love and Friendship. One Necklace with Genuine Pearl Beads on a 18 inch Silver Chain. ORDER TODAY! 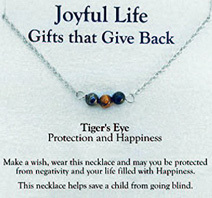 • Joyful Life Necklace Tigers Eye / Protection: Exhibit this necklace and may you be Protected from negativity and your life filled with Happiness. One Necklace with Tigers Eye Beads on a 18 inch Silver Chain. ORDER TODAY! Simply twist the bottle open and you can unlock the Magic of Aromatherapy with Pure Essential Oils. Made with 100% essential oil pre-blended with Jojoba Oil. CAUTION: If pregnant, nursing, suffering from any medical condition or taking medication, consult a health care pratitioner before use. Avoid eyes and mucous membranes. May irritate skin. Not for internal use. Keep out of reach of children. 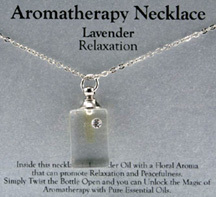 • Aromatherapy Necklace Lavender / Relaxation: Contained in this necklace is Lavender Oil with a floral aroma that can promote Relaxation and Peacefulness. ORDER TODAY! Ingredients: Simmondsia Chinensis (Jojoba) Oil, Lavandula Angustifolia (Lavender) Oil.Plant Part: Leaves, Stems & Flowers. 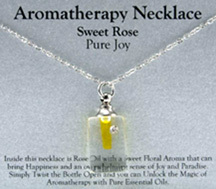 • Aromatherapy Necklace Sweet Rose / Pure Joy: Included in this necklace is Rose Oil with a sweet floral fragrance that can bring Happiness and an remarkable sense of Joy and Paradise. ORDER TODAY! Ingredients: Simmondsia Chinensis (Jojoba) Oil, Rose Damascena (Rose) Absolute, Plant Part: Flowers. 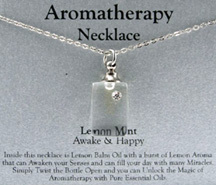 • Aromatherapy Necklace Lemon Mint / Awake & Happy: Inside this necklace is Lemon Balm Oil with a burst of Lemon fragrance that can kindle your senses and can fill your day with many Miracles. ORDER TODAY! Ingredients: Simmondsia Chinensis (Jojoba) Oil, Melissa Officinalis (Lemon Balm). Plant Part: Leaves, Stems & Flowers. 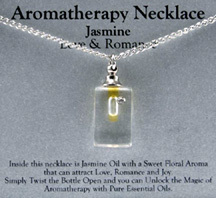 • Aromatherapy Necklace Jasmine / Love & Romance: This necklace comes with Jasmine Oil with a sweet floral fragrance that can attract Love, Romance and Joy. ORDER TODAY! Ingredients: Simmondsia Chinensis (Jojoba) Oil, Jasmine Officinale (Jasmine) Absolute, Plant Part: Leaves, Stems, Flowers. Made with Swarovski® Elements Crystal. Proudly Assembled in USA. • Jewels From The Heart Necklace Live, Laugh, Be Healthy: May you sparkle with good health and be protected always. ORDER TODAY! • Jewels From The Heart Necklace Keep Calm and Sparkle On: Keep Calm and Sparkle On No Matter What, Just Keep Calm and Sparkle On! ORDER TODAY! • Jewels From The Heart Necklace Follow Your Dreams: Follow your dreams, may your dreams come true and you always shine with happiness. ORDER TODAY! • Jewels From The Heart Necklace Dream Big: Dream Big Always, Dream Big and Never Give Up. ORDER TODAY! • Jewels From The Heart Necklace Happiness: May you sparkle with happiness and create beautiful memories that last forever. ORDER TODAY! • Jewels From The Heart Necklace Love and Friendship: May you sparkle with love, great friendships and happiness. ORDER TODAY! Lucky Gemstone Rings are mixed with Genuine Gemstones that stretch to fit most fingers. 2 Rings/Set. Ages 14+. • Lucky Gemstone Rings Hematite Tigers Eye (Happiness) / Hematite Amethyst (Good Health): This set contains first ring with magnetic Hematite gemstone beads mixed with 1 larger Tiger's Eye gemstone bead (Happiness). 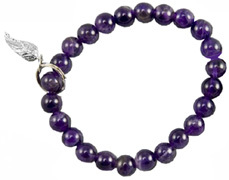 The second ring with magnetic Hematite gemstone beads is mixed with 1 larger Amethyst gemstone bead (Good Health). 2 Rings. ORDER TODAY! • Lucky Gemstone Rings Amethyst (Good Health) / Tigers Eye (Protection): This set contains first ring with all Tiger's Eye gemstone beads (Protection) and second ring with all Amethyst gemstone beads (Good Health). 2 Rings. ORDER TODAY! • Lucky Gemstone Rings Hematite (Happiness) / Onyx (Prosperity): This set contains 1 ring with all Hematite gemstone beads (Happiness) and 1 ring with all Onyx gemstones (Prosperity). 2 Rings. ORDER TODAY! • Lucky Gemstone Rings Hematite Turquoise (Good Luck) / Hematite Agate (Unexpected Miracles): This set contains 1 ring with magnetic Hematite gemstone beads mixed with 1 larger Turquoise gemstone bead (Good Luck). The second 1 ring contains magnetic Hematite gemstone beads mixed with 1 larger Agate gemstone bead (Unexpected Miracles). 2 Rings. ORDER TODAY! • Lucky Gemstone Rings Agate (Unexpected Miracles) / Blue Sodalite (Peace and Joy): This set contains 1 ring with all Agate gemstone beads (Unexpected Miracles) and 1 ring with all Blue Sodalite gemstones (Peace and Joy). 2 Rings. ORDER TODAY! • Lucky Gemstone Rings Hematite Pearl (Love Friendship) / Hematite Onyx (Properity): This set contains first ring with magnetic Hematite gemstone beads mixed with 1 larger Onyx gemstone bead (Love Friendship). The second ring magnetic Hematite gemstone beads mixed with 1 larger genuine Pearl bead (Prosperity). ORDER TODAY! HEALTH RELATED/BIO MAGNETICS: Lucky Gemstone Rings, 2 pc. 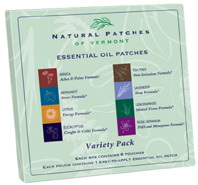 Natural Patches: Natural Patches of Vermont Body Patches utilize the energy of pure essential oils and aromatherapy to help open the passages to energetic health and well-being. Basically place the patch on your upper chest, any pulse point or the location therapy is needed. Once the essential oils are triggered by your body heat, they will start to release their therapeutic benefits. 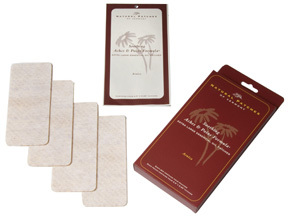 Natural Patches are free of any artificial colors, fragrances and Latex, and no animal testing. • Aromapatch Therapy XL Arnica, 4 ct.: The warming and revitalizing Arnica blend targets the aches and pains in muscles and joints to renew physical freedom. Extra-large size for large areas of pain: lower back, shoulders and neck. The patches are easy to apply and leave no greasy residue. Patch may be cut to fit and patch may be worn for up to 24 hours. Contains: 4 XL Patches in a re-sealable pouch. Patch measures 2.5" x 6.25". 4 ct. ORDER NOW! Ingredeints: Olive Oil, Arnica, Cayenne, Rosemary, Lemongrass and Ginger essential oils. -- Arnica (Soothing Aches & Pains): Warming and stimulating aromas with Arnica help target tense / sore muscles and joints. -- Bergamot (Calming Stress): Uplifting, balancing and anchoring aromas with calming Lavender help encourage relaxed composure, calmness and stability. -- Eucalyptus Citriodora (Cough & Cold): Invigorating, revitalizing, and enriching aromas with Lemon Eucalyptus help relieve symptoms related with the common cold. -- Lemongrass (Mental Focus & Energy): Heartening, awakening and rejuvenating aromas with the comforting and sensual fragrance of Ylang Ylang help open the passages to clear thinking and mental consciousness. -- Rose Geranium (PMS & Menopause): The mood brightening, centering and calming aroma help offer balance during some of the most difficult and challenging moments in a woman's life. -- Citrus (Energy Formula): Elevating, motivating and refreshing aromas with soothing Lavender help you stay awake, attentive and active. -- Lavender (Sleep Formula): Comforting, soothing and stabilizing aromas help clear your thoughts and relax the mind so that you fall asleep naturally. -- Tea Tree (Itch & Skincare Formula): Relaxing, purifying and balancing aromas help produce a calming skin-care blend suitable for use on rashes, breakouts, insect bites. Patch Dimensions: 2.8" x 2.2". 8 ct. ORDER NOW! Aromapatch Therapy XL Arnica, 4 ct.
Aromapatch Therapy Variety Pack, 8 ct.
HEALTH RELATED/BIO MAGNETICS: Aromapatch Therapy XL Arnica, 4 ct.
HEALTH RELATED/BIO MAGNETICS: Aromapatch Therapy Variety Pack, 8 ct.
Approved by the FDA, Sea-Band wristband is a leading drug-free remedy for morning sickness, motion sickness, chemotherapy nausea and post-operative nausea. Most recently, a 2010 study, carried out at a German clinic specializing in migraine and headache therapy, showed that Sea-Band wristbands significantly reduced nausea and vomiting: 83% noticed perceptible reduction and 44% found their symptoms markedly reduced. Accupressure Wrist Band: The Sea-Band has been clinically tested against nausea and vomiting in travel, anaesthesia, pregnancy and chemotherapy. 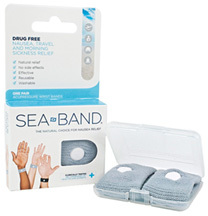 Sea-Band is a knitted elasticated wrist band, are drug-free and work by exerting constant pressure on the P6 (or Nei-Kuan) acupressure point on the inner wrist. The stimulation causes the nervous system to release chemicals that help trigger the body's natural healing abilities. 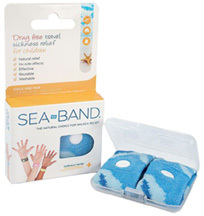 Because Sea-Band is drug free, it means that there are none of the side effects associated with anti-nausea products, such as drowsiness or dry mouth, and can be safely used by children and adults, including pregnant women, those undergoing chemotherapy, and in conjunction with migraine medication. Clinically tested, the bands work within five minutes after being applied and can be worn at the onset of nausea and for as long as needed or reused if nausea returns. 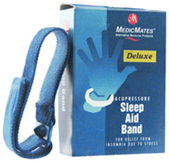 • Accupressure Wrist Band Adult: ORDER NOW! • Accupressure Wrist Band Child: ORDER NOW! • Flight Spray®: Flight Spray® Is The First Germ-Fighting Nasal Hydration Spray Designed Especially for Airline Travelers. Flight Spray was formulated for those concerned with nasal dryness and the potential to catch colds, flu and sore throats due to recycled airplane air and the close proximity to those who have transmittable symptoms. 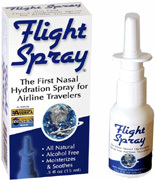 Flight Spray enhances the body's immune ability to fight against infection, moistens the nasal passages in dry airplane cabin environments and clears the sinuses during long flights. It is especially effective while traveling, in a crowd, or at close proximity to people with cold or flu symptoms. Flight Spray is the first all natural nasal hydration spray formulated especially for airline travelers, is allowed under current Transportation Security Administration regulations to be carried onto airlines. For external use only. 11 ml. ORDER NOW! Notice: Flight Spray Can Fly! "Airline passengers may now carry on toiletries of 3 oz. or less in one sandwich size, clear plastic, zip-top bag." U.S Transportation Security Administration. HEALTH RELATED: Flight Spray, 0.5 oz.